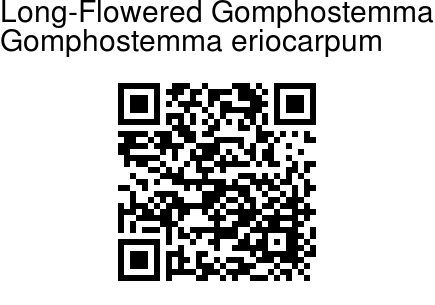 Long-Flowered Gomphostemma is a slender, erect, perennial herbs up to 75 cm tall. Leaves elliptic-oblong or inverted-lanceshaped, base pointed, margin sharply toothed, tip tapering, up to 15 cm long and 5cm broad, rough above; leaf-stalks up to 2.5 cm long. Cymes of the whorls stalkless. Flowers are light yellow, bracts lanceshaped, shorter than calyx. Calyx-teeth ribbed, linear-lanceshaped, about 1.25 cm long. 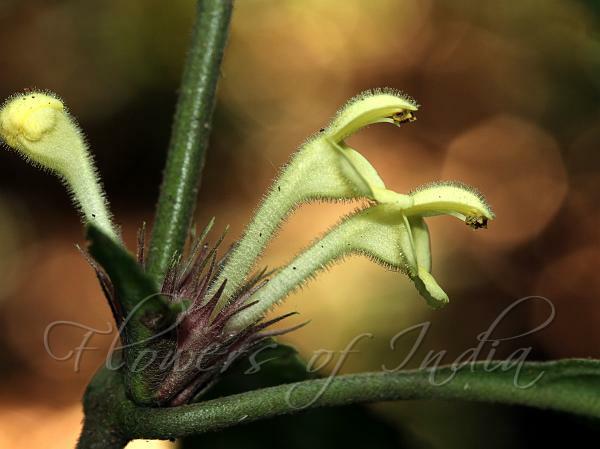 Flowers are about 3.7 cm long, velvet-hairy, flower-tube protruding, up to 4 mm long, very slender. Fruits are nutlets, hairy, spherical. Long-Flowered Gomphostemma is found in Western and Eastern Ghats. Flowering: August-December.